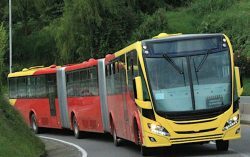 Faber Industrie Spa (Faber), Italian producer of seamless steel and composite cylinders, has been awarded the supply of Type 4 CNG (compressed natural gas) cylinders (tanks) for the renewal of the tender for Bogota’s TransMilenio Bus Rapid Transit System fleet. This tender, awarded by Scania, has just been won for buses running on natural gas. With more than 2 million passengers mobilized per day, TransMilenio is the world’s largest Bus Rapid Transit System. Faber will be the sole provider of these composite Type 4 CNG cylinders for both the Scania articulated buses of 320 HP, with a capacity of 160 passengers, and the Scania bi-articulated buses of 340 HP, with a capacity of 250 passengers. Faber is fully committed to supporting the growing CNG market in Colombia, a country where CNG is seen as a clean fuel that contributes significantly in reducing CO2 emissions as well as eliminating particulate matter (PM) and NOx. “At Faber, we offer a safe, light, reliable and an affordable product, designed and manufactured in Italy, that perfectly fits all the Bus market’s needs all over the world”, continues Francesco Ponte, Head of the Automotive Sales Division. Established in 1972, Faber has grown rapidly to become the world’s leader in the production of cylinders (Types 1, 2, 3 & 4) for the storage of CNG and hydrogen for use as an on-board fuel. 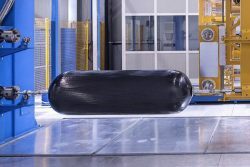 The world over, with a production capacity of over a million cylinders, Faber has earned the best reputation for its high standards of quality and for its capability to comply with the most stringent specifications set down by International Bodies, Local Authorities and its customers. Faber is a member of NGV Italy and associate member of NGV Global.